Sept. 6, 2016. Undergraduate Will Amos, manager of professor Jesse Colin Jackson’s Speculative Prototyping Lab. has been named one of six national winners of the 2016 Brower Youth Award recognizing outstanding youth leaders making a difference in the environmental movement. 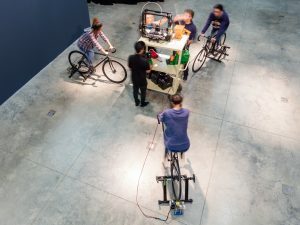 Amos, an environmental engineering major, leads a UC Irvine team of art and engineering students creating a bicycle-powered, closed-loop 3-D printer/print recycling station. Known as S.P.A.M. (Specialists in Plastic Additive Manufacturing), the MDP team grew out of last fall’s Solar Decathlon. Team Orange County members were tasked with creating a “Tool Room of the Future” for the Casa del Sol home they were designing and building; they began developing the sustainable 3-D printer for the home.